A lot of people are preoccupied with time: How it should be spent, how it can be saved, and how to make sure it isn't wasted. Have you ever accused someone of stealing your time? Momo is the only person who is able to resist the allure of the grey men who are time thieves. 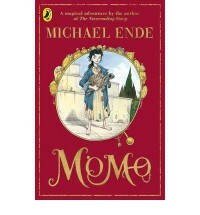 An already unique child, Momo, is abandoned by all of her friends who have fallen prey to these menaces (and they really do sound menacing + the illustrations are delightfully creepy). Much like The Neverending Story, the city that Michael Ende has created feels tangible and real...actually it sounds like Rome. The characters leap off of the page. Fantasy is done right when your imagination is allowed to run rampant and a talking turtle is as ordinary as a gorilla that learns sign language (I still think that's amazing). Momo is all about making the most of your time by spending it with those that you love. I think this is an especially poignant message for adults who are bombarded with deadlines and to-do lists and children who often feel neglected by those same adults. The message is clear but the delivery is what makes Ende's writing so special and why I believe he is an underrated children's author in our country (but not in his home country of Germany! ).